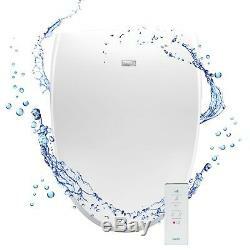 A8 Serenity Elongated Bidet Toilet Seat. The A8 Bidet Seat is designed for Elongated toilets. The ultimate hygienic solution with a stainless steel nozzle. In bowl nightlight offers added convenience. Enjoy the perfect bidet seat for the industry leader Pick yours up today and learn why BioBidet believes Water Does It Better. From the moment you sit down, youll know that the A8 was designed with your utmost comfort in mind. Soft curves offer reliable and dependable support for every user in your home. Serenity caters to all your senses in new ways. The new uni-body design of the lid has a contemporary look with a singular silhouette that melds into the backdrop of your bathroom. The structure has been re-imagined to be more reliable and dependable for day-to-day use by the entire family. From regaining independence in the bathroom to paving the way towards learning proper hygiene, everyone can have a spa-like experience from the comfort of your own home. Uni-body design offers the perfect silhouette. The best of both worlds, for the world. Quick release for easy cleaning. Made in USA or Imported. STAINLESS STEEL NOZZLE - Provides a posterior wash for him and feminine for her, improves hygiene. SMART SEAT, SMART DECISION - Streamlined comfort, adjustable heated seat and water, slow closing lid. FEEL THE DIFFERENCE Oscillating wide clean and pulsating massage technology with bubble infusion. ECO FRIENDLY - Energy Save Mode reduce electricity and toilet paper, good for the environment. DUAL SIDED WIRELESS REMOTE CONTROL - User Presets to save your favorite settings. At BioBidet, we believe'Water Does it Better' and are passionate about the positive impacts our bidet toilet seats, attachments and advanced smart home products bring to people around the world. Our passion has led us on the quest to develop and offer products that increase the function and beauty of your home. A8 Premire Bidet Toilet Seat. The start of new class - The Serenity A8 encompasses all you need in a total cleaning and comfort system. A truly personal experience is the goal of the new A8 design. Sound, sight, and temperature controls are now available, like never before. Serenity caters to all of your senses in new ways. User controls include the ability to change virtually everything from the softness of the spray, the chime of the controls, and the glow of the night light- all features that were previously not normally adjustable can now be modified from the dual-sided wireless remote. Bio Bidet values your business and always attempts to provide you the very best of service. It's commitment from Bio Bidet to maintain a high degree of quality, dependability and reliability. Dual speed warm air dryer. We stand proudly behind the products we sell. Bio Bidet Premier A8 Serenity Toilet Heated Seat Warm Water Dryer Elongated" is in sale since Tuesday, September 11, 2018. This item is in the category "Home & Garden\Home Improvement\Plumbing & Fixtures\Bidets & Toilet Attachments". The seller is "greatgoodies4sell2010" and is located in Temple City, California.